2007 Supertec mdl. 020P-50NC 8 ½” x 16” CNC Cylindrical Grinder s/n GB07019 w/Supertec Controls, Sony DRO, Hand Wheel, Motorized Work Head, Tailstock, Coolant. Bridgeport Series 1 – 2Hp Vertical Mill s/n 237549 w/ 60-4200 Dial Change RPM, Chrome Ways, Power Feed, 9” x 48” Table. Tree mdl. 2UVR Vertical Mill s/n 170560 w/ 60-3300 RPM, Colleted Spindle, Power Feeds, 10 ½” x 42” Table. Tongil TIPL4SP 400×1060 ( 15 ¾” x 41” ) Geared Head Gap Bed Lathe s/n 8J00509413 w/ 55-1600 RPM, Inch/mm Threading, Tailstock, Steady and Follow Rests, Indexing Tool Post, 8” 3-Jaw Chuck. Hardinge mdl. 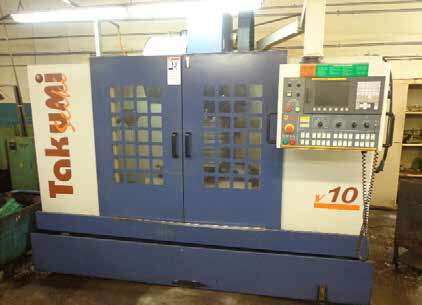 DSM-59 Second OP Lathe w/ 125-3000 RPM, Cross Slide, 6-Station Turret Assy, 5C Collet Closer, Coolant. Cincinnati No.2 Centerless Grinder s/n R5709/6 w/ Hydraulic Wheel Dresser, Feed Wheel Dresser, Coolant. Cincinnati No.2 Centerless Grinder s/n 2M2H1J-616 w/ Hydraulic Wheel Dresser, Feed Wheel Dresser, Coolant. Cincinnati No.2 Centerless Grinder s/n 2M2H1J/40 w/ Hydraulic Wheel Dresser, Feed Wheel Dresser, Coolant. Brown & Sharpe No.2 6” x 18” Auto Surface Grinder (NO CHUCK). Darex mdl. V100 Precision Drill Sharpener. Darex mdl. E-90 Precision Endmill Sharpener w/ Acces. Powermatic mdl. 35 12” Disc Sander s/n 335181 w/ Stand. Lincoln Squarewave TIG-175 TIG Welding Power Source. Kenco 5 Ton OBI Stamping Press w/ Stand. Sunmax 9” x 16” Horizontal Band Saw w/ Manual Clamping, Work Stop, Coolant. Rigid 14” Abrasive Cutoff Saw w/ Stand. (2) Haas 4th Axis 5C Rotary Heads.